Begin this program 7 weeks directly before you are scheduled to begin SWAT selection. The program includes a 1-week taper which will allow you to recover and prepare for your selection. Overall, this program has a sharp focus on improving your aerobic capacity, muscular endurance, stamina, strength and anaerobic capacity. The following plan is a suggested preparation program. We do not guarantee that if you complete the training program, you will pass or be selected for your SWAT program. 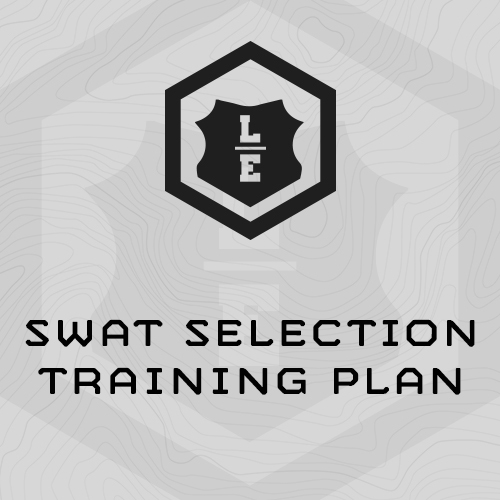 This plan incorporates training for most of the common SWAT testing and training events. It may not cover every event in your program. We highly recommend that you research the SWAT program you will be testing for and make sure that its events are similar to the ones we will be training. This plan can be very intense at times and may not be suitable for unfit athletes. This program follows a general format and gets progressively harder each week. Training is designed in a Monday – Friday scheme with an optional event on Saturdays for those who require addition training time in their weight vest or gear (5-6 days on, 1-2 days off). If you are unable to follow this format, that is fine. Simply do the workouts on the available days of the week without skipping workouts. This training program is 7 weeks long and is divided into 3 phases. Phase I focuses primarily on body weight strength and running while introducing strength and obstacle course events. Phase II puts more emphasis on strength, weighted running and weighted obstacle course events. Phase III is a recovery week. It allows you to test and assess your training improvements, but most importantly, rest prior to your SWAT selection and training. We strongly recommend you train in whatever uniform you will be using during your testing and training. In most cases this will be your utility or combat uniform (or SWAT equivalent). During your gym training sessions you may wear whatever attire you find most conducive to heavy strength training. However, since you will most likely be running and completing most other events in your SWAT utility uniform we recommend you train in it whenever possible. At a minimum we recommend you complete all running and work capacity events in your boots. "I want to say thanks. Your SWAT selection plan worked incredibly well for me and I had no physical limitations during my selection process."